Carmel Dolan, wife of Richard Dolan, Castledaly, who was one of a number of winners who received their prizes at the Athlone Municipal District building. Photograph by Moore Photography. An Athlone lady received a pre Christmas boost when she was selected as one of two winners to have their household waste collection costs for a year. Michele Dooley, claimed the prize, worth €380, along with her co-winner Carol Meally from Mullingar, while there were five runner up prizes, worth €100, one of which was awarded to Castledaly resident, Richard Dolan. 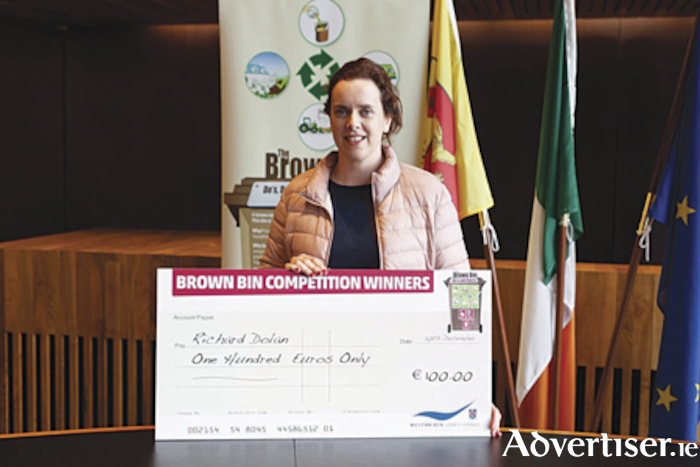 A Westmeath County Council initiative, the competition was launched in early November to raise awareness of the brown bin service used for the collection of all your household food waste. ‘Benny’ the Brown Bin was on hand to assist local authority Cathaoirleach, Cllr. John Dolan, to reveal the competition winners. “The competition, which was run to raise awareness of the brown bin service, it is a great way to make people aware of the brown bin and the advantages of using it - it can save you money because you become more aware of the food you waste, it’s better for the environment because you avoid sending food waste to landfill where it produces harmful greenhouse gases and it’s brought by the waste collector to a facility where it is used to produce high quality compost – three excellent reasons for using the brown bin,” the Cathaoirleach commented. Representatives from the waste collection companies operating throughout the county were also present to meet and congratulate the winners. “This competition is part of the Council’s Environmental Awareness Programme and is aimed at raising awareness of the brown bin, the legal obligation for householders to segregate their food waste and the legal obligation for waste collectors to provide the brown bin service in agglomerations with a population of 500 people or more. The Environment Department have been liaising with the waste collectors on this promotion and their support for the campaign is appreciated,” Ruth Maxwell, Environment Department, Westmeath County Council, acknowledged. The brown bin is for the collection of food waste and any type of food waste can be placed in it whether raw or cooked including meat, poultry, fish and bones. The bin can be lined with paper or by using a compostable bag with the EN 13432/seedling logo. Plastic bags are not allowed to be used as bin liners in the brown bin as they are made from petrochemical plastics that do not break down in the composting process but contaminate it.